The below talk was given by PROUT founder Shrii Prabhat Rainjan Sarkar on the 10th anniversary of his release from jail. 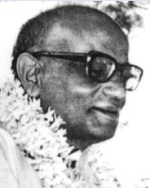 The picture of Sarkar (left) was taken at the occasion of him giving his first discourse to his followers after he was released on August 2, 1978. The photo was taken by a journalist of Stern (Germany) and published in a three page report in that magazine. (August 2, 1988) – We did not mean to harm anyone. But when adhármika [unrighteous] people use force against you, you must act in self-defence. This is not hiḿsá [violence], it is pratirodha [self-defence]. Those who opposed us met a pathetic end and have now merged with the soil. People who follow unrighteousness believe they have the right to do anything they want. One lady thought she could do anything she wanted with her power. When no reaction comes immediately, sinners think they can get away with more. But gaining power, going up, does not mean that they are getting elevated. Like the Indian washerman who raises the clothes high over his head, they go up very high only to come smashing down. "I do not want anyone to undergo the same trouble that I did." Some people say that for every action there is an equal and opposite reaction. But I do not say that. After time, the reaction is greater because it comes with interest. Three thousand five hundred Margis and workers were arrested by the government. All were innocent, yet the political leaders felt no guilt at all in using their power against these innocent people. In jail, the Central Bureau of Investigation authorities harassed me in every way. For example, there was a rule that when I met with visitors the officers could be present, but not within hearing distance. One time, though, a new CBI man stood very close, silently listening. I asked him who he was – he replied that he was newly appointed. So then I asked him his name and address. He became nervous and could not reply. So I shouted and abused him until he ran away. Then the other officers, who clearly were aware of this plot, began to criticize that man in order to appear innocent. But I had bit down so hard while scolding him that two of my dentures broke. The next day, two specialists came from the government hospital to replace the broken teeth. I asked them, “How is it that these teeth broke so easily?” They replied, “Bábá, they are only plastic, they are fragile.” But according to the prison regulations, the treatment of the eyes and teeth of prisoners is their own responsibility, not the government’s. I knew these specialists had been sent because the officers were feeling guilty at what they had done. So I asked them, “How can I chew my food every day with teeth given by the sinful government?” Then my personal assistant suggested that if we paid them for the work it would be all right, so I agreed. When I was released, there was such a long procession – do you remember? The jail authorities, seeing the crowds waiting, told me that they would also be willing to undergo imprisonment if such a procession would be awaiting them on their release. I faced so much trouble in the jail. When I was released, I could not walk. To go to the toilet I had to hop on my hands like this [demonstrates]. I had to use a wheelchair. I remember that my elder sister brought me two lucis [unleavened bread puffed by deep frying] and vegetables, but after my long fast I could only eat half of one of the lucis with great difficulty. I do not want anyone to undergo the same trouble that I did. But in the struggle for dharma, if some trouble comes, you should accept it. If you pick a flower, you may be pricked by its thorns. Your consolation is that your struggle will surely end in victory. Our path is kliśt́á-akliśt́á – initially there is trouble, but in the end there is no trouble. Dharma is the cause of victory. Intelligent people should take the help of dharma. If you want to go to Jammu, you should take a seat on the Jammu Express train – automatically you will reach there. Similarly you should follow the path of dharma and surely you will be victorious. Copyright Ananda Marga Publications 2012. All rights reserved. I want to know more about Ananda Marga. The story or P.R. Sarkar’s jail period is really very pathetic. The Indian Govt.did a mojor mistake then. Honestly speaking the Govt should give maximum importance to such a magnificient personality. Govt shluld rectify their policies so that no good person would get such a biased treatment. I sincerely salute the bravest person like Shri P.R. Sarkar. Only prout philosophy of p.R. Sarkar if is implimented in reality we shall get a new world of prosperity, peace and creativity. Please share this prout philosophy to maximum person.thanks. There should be reachers on him . Rectification required in constittuition to empower only moralist in politics so that right and part of property of common people must be made available.